Year 1 is taught by Miss Watkins. Mrs Brown helps support us with our learning. Miss Watkins enjoys planning and delivering creative lessons taken from the children’s interests. Our topics often include ‘Heads and Tails’, ‘Superheroes’, and ‘How Does Your Garden Grow’. She is the subject leader for Art and Design & Technology, so loves teaching the children new forms of art and encouraging children to be imaginative and creative. Just look at some of the things we have been doing so far. This term Year 1 have been learning about heroes. We discussed all the superheroes we know, from TV programs, comics, books and games and then designed our own superheroes. They had some very imaginative super powers! We then looked at our own heroes and painted portraits using watercolours. We displayed these in our very own class gallery. We are so proud of our work and love looking at everyone’s portraits and finding out why they are all heroes. This week we enjoyed a visit from a community hero. After comparing fire fighters from the past to fire fighters today, we loved hearing stories from a real fire fighter. He told us all about what fire fighters do, what uniform and equipment they need and what makes a good fire fighter. Some of us even got to try on a fire fighter’s helmet. I think we have some fire fighters of the future in Year 1. As a reward for whole class effort and exceptional behaviour in Year 1, we get a marble to go in our treat jar. Once it is full we come up with ideas of a treat and vote on what we would like to do. This time it was wearing pyjamas, bringing our own toy to school and watching a film with a special snack. Now it is time to start filling our next jar! This week we were also lucky enough to enjoy another music lesson from Mrs West. We learnt new songs and loved playing the chime bars. We have learnt about pitch and even started composing our own tunes! On Thursdays we have the opportunity to go on a welly walk with Squirrel. Here is a group enjoying this week’s mud and sunshine! 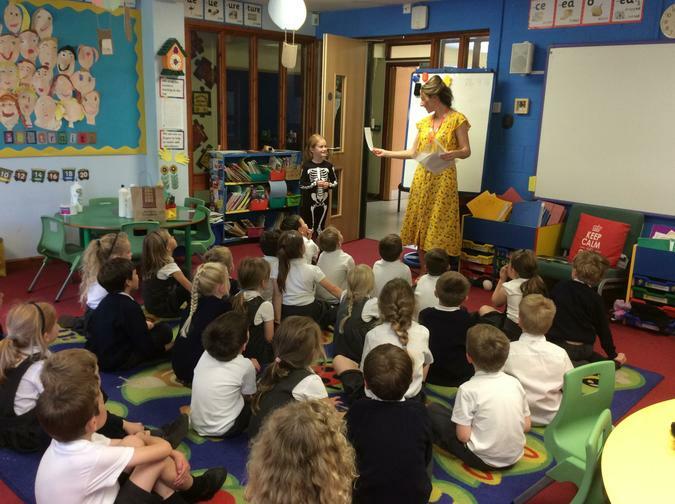 The highlight of our week in Class 1 has been dressing up in our fantastic costumes and perform to our grown-ups. We loved working with the Year 2 children on our performance of ‘The Christmas Express’. We hoped you loved it too! 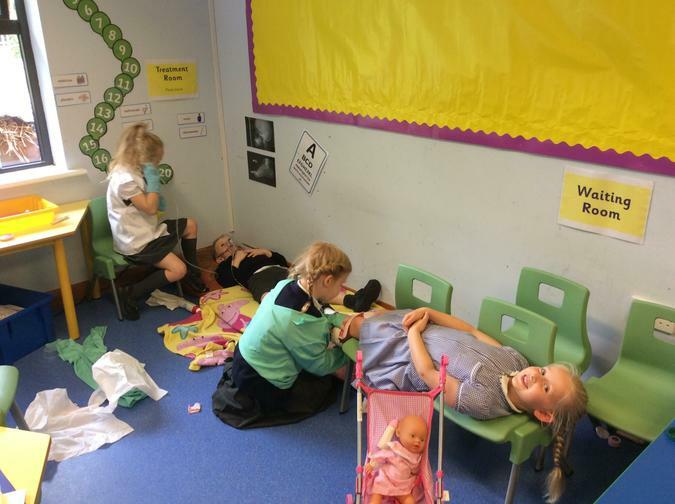 This term we have been continuing to learn about animals, so we changed our role pay area from a doctors' to a vet surgery. We have had great fun caring for all of the animals, grooming them, feeding them and making them better. We have also had some real pet visitors come into the class to visit us. This term we have also learnt to label animal body parts, group animals and about carnivores, herbivores and omnivores. In maths we have been practising our number bonds to 10. To help us we have been singing songs and we made shiny number bond butterflies. To help us learn about humans we had a visit from a parent who works in the hospital. We found out about x-rays and different bones in our body. 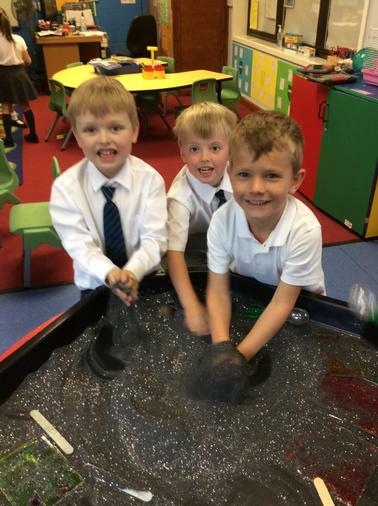 We love hunting for shapes in the sand and playing in our doctors surgery. 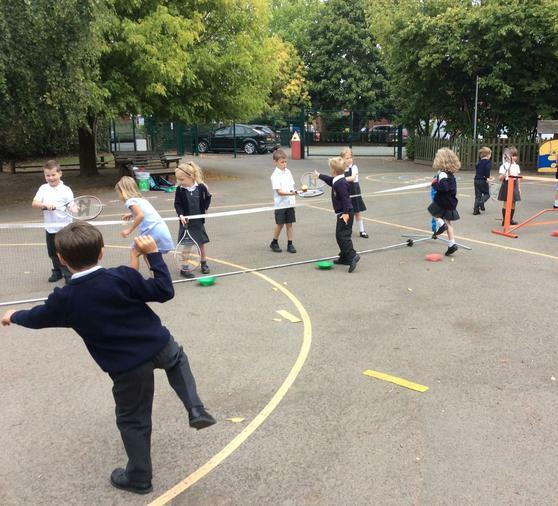 On a Monday we practise our tennis with our tennis coach Steve. We have been enjoying our forest school sessions with Richard from Really Rural. We have been making pictures in the woods and we made own brooms to help tell the story of Room on the Broom.